Diabetes in Cats. Blood Glucose Curves I have done on my diabetic cats. Blood glucose curves I’ve done on my diabetic cats and what those curves told me. The picture above is the very first blood glucose curve I ever did. I debated whether to include it or not, because looking back now it makes me very embarrassed! But! If my errors help you then a little of my shame is worth it! 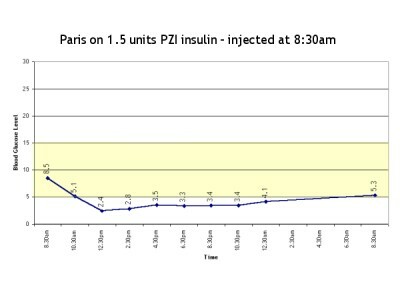 This is a blood glucose curve on Paris, on 1.5 units of PZI insulin once a day, injected at 8:30 in the morning. The first thing this chart shows me is that poor poor Paris should NOT have had an insulin shot at all this day - with a reading of 8.5 mmol/l he was only just outside the range for a normal cat! 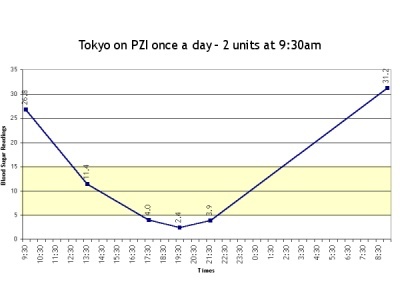 Consequently, Paris spent approximately 12 hours from 11:00am to 11:00pm being under the normal range, thus risking a potentially fatal hypoglycaemic episode. 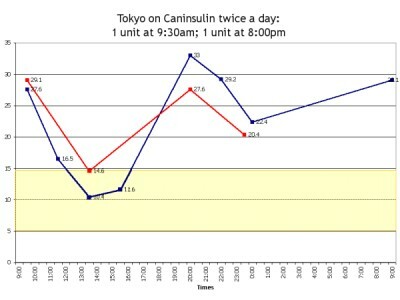 The good news is that this chart seems to show that one shot per day of this insulin gives adequate coverage for him. In other words it kept his blood glucose levels down from 8:30am in the morning until about 1:00am when his blood glucose level started to rise. Just to prove that I can learn from my own mistakes, his closing reading on this chart (5.3 mmol/l) which was his reading at 8:30am the following morning meant he didn’t get an injection that day! This second image is one of Tatty’s early charts. 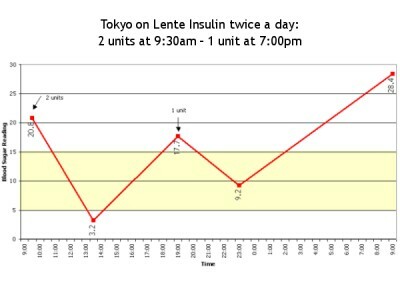 It shows her readings on Lente insulin twice a day. She was getting two units in the morning at 9:30am and one unit at 7:00pm. Again the yellow band covers readings from 5 to 15 millimoles per litre (mmol/l) which I would consider acceptable. Above about 12-15 the kidneys are overwhelmed and the renal threshold exceeded - and long-term damage to the kidneys could result. This chart is too spiky. She starts the day very high at 21.3 mmol/l and just four hours later she’s dropped to a dangerously low 3.2 mmol/l. At next injection time she’s back up at 17.7 and just three hours later she’s down to an acceptable 9.2. But even then notice that at about 2:00am her blood sugar level has gone above 15 and her kidneys will be under pressure to shift all that extra sugar again - not good. 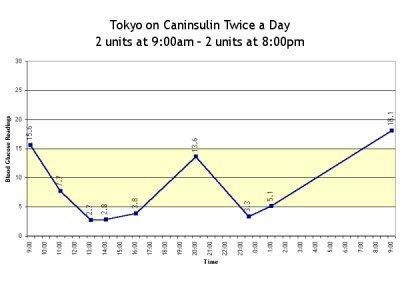 This chart tells me that this insulin doesn’t last long enough in Tatty’s system - after both injections her blood glucose levels start to rise again after just four hours. It also tells me that this insulin pushes her blood glucose levels down too far too fast - classic signs of Somogyi rebounding. She’s spending too long outside an acceptable blood glucose range - about 12 hours in each 24 hour period. Now we might be getting somewhere. Although this chart is again too spiky W shaped, at least she spends a good deal of the day within the acceptable level - about 13 hours of the day. The problem here is not so much that she goes rather high as the insulin wears off and prior to injection (as high as 18.1) but that she spends two periods a day when she’s in the dangerously low area and is risking a hypoglycaemic episode. 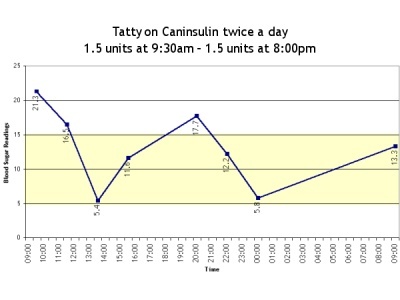 This is Tatty’s graph, on one unit of Caninsulin twice a day. One shot at 9:30am, and the evening shot at 8:00pm. I think the only good thing that could possibly be said about this blood glucose curve is that she wasn’t going to have a hypo incident with numbers like these! I had been so hopeful after her graph at 2 units twice daily that I did hope that using one unit twice a day would be a good level for her. But obviously not. In case it isn’t clear from the picture above, her blood glucose reading was so high at 8:00pm on the blue line that my monitor just said HI which under other circumstances would seem nice and friendly, but under these circumstances means Tatty’s blood sugar level was too high to be read by the monitor. So now we tried PZI insulin, the same insulin that her brother is on. I was hoping that she might do as well on the same treatment. This was Tatty’s fourth insulin, and I was getting a bit desperate. And it would have been very handy to have them both on the same routine I thought! Finally! We seem to have achieved something. It’s not a perfect blood glucose graph, but she’s spending most of the day within an acceptable range. It’s too spiky W still, but after countless curves on Tatty it seems she just chews through insulin so quickly that all her charts are spiky. She is high for a few hours each day, which does mean her kidneys are having to work extra hard to shift all that sugar, but she’s also happy in herself at this level. She’s eating well, doing her normal stuff, and I noted on her chart that day that she’d beaten Paris up after her morning walk around the garden! My vet and I decided that we probably wouldn’t be able to get Tokyo any closer to a curve that looked like a non-diabetic cats, and as she was so well we decided we’d stay on this dose for a while.